As an activist in Philadelphia, I have been mentored by Pam and Ramona Africa of the MOVE family. They are two women whose love of truth supersedes their acceptance of the status quo. Over the years, I have heard them speak about their lives as members of MOVE. The MOVE family is a radical black liberation group started by John Africa in 1972. MOVE remains dedicated to protesting against police brutality, professing the values of raw foods, animal rights, and sustainable urban agriculture. In short, MOVE was invested in a “green” lifestyle long before it was trendy. 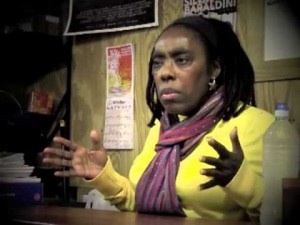 Ramona Africa is the sole adult survivor of the 1985 bombing of the MOVE family home. 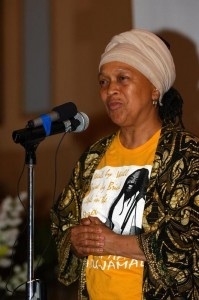 Pam Africa is the leader of the international social movement demanding the release of award-winning journalist and U.S. political prisoner Mumia Abu-Jamal. I recently had a conversation with Pam Africa and Ramona Africa in which they shared how they became members of the MOVE family and their own revolutionary journey as freedom fighters. Ramona Africa and Pam Africa might not be women that you are familiar with, but after reading this piece, you will not only acknowledge their contributions to the movement, you will also marvel at their unconditional love for one another and for communities of color. JW: Tell me why you decided to become a member of the MOVE family? PA: It was the 1977 MOVE confrontation. May 20th, I remember it so vividly; it was a Friday. I did not like MOVE, and I used every opportunity to let them know. I remember seeing Eddie Africa on the platform with what appeared to be a rifle in his hands. Being the nosey person I am, I went down to get a closer look and stood there watching. Sure enough they were walking back and forth on the platform with weapons. I saw a cop car driving past and thought, “these cops are going to arrest these mutherfuckers in a minute,” and I was going to have a front row seat to see and tell all my friends what I saw. But they didn’t. Then MOVE got on their bullhorn telling stories about what had been happening to their family, and why they were taking a stance against the police. They were saying that the police were coming to kill them. When MOVE started talking, neighbors were coming out standing in solidarity with them. I am watching all of this, listening to MOVE dispel all the lies the media was saying about them. This government and the press have a tendency to make you see what they want you to see, regardless of you looking at the truth; you believe the lie. I’m a clear example of this. For years, I would look at the truth and believe the lie. Here it is the confrontation between MOVE and the city, and you have the truth and the lie before you. It wasn’t until I heard those words of revolution and saw those examples that I ran and broke through the barricades and stood in between MOVE and the police. When it came time for the people to take a stand, people did not have guns – they knew how crazy [Frank] Rizzo’s cops were – it did not matter. The people chose to defend the truth. That’s why the cops did not kill MOVE on May 20, 1977. That was a strategy John Africa had that won a lot of people, including myself, support for MOVE. MOVE took me as I was. I was always fiery. John Africa saw those traits in me and molded it into what you now see, Pam Africa, Minister of Confrontation. RA: It was 1979 and I was in my last year at Temple University. I got involved with Milton Street (brother to former Philadelphia mayor John Street) and his movement around housing and we would go into City Council every Thursday and shout City Council down about housing issues. I ended up getting arrested one Thursday. This was my first time being arrested. When I went to court. I met a brother, and we exchanged information. He called me at work and asked if I wanted to go to a meeting to plan a MOVE demonstration. I went to the meeting, and that’s where I met my sister Pam Africa. She was still a supporter then, not a MOVE member at the time. She started talking to me, telling me so many things about MOVE. She knew I was getting ready to go to law school and told me I should go over to City Hall and sit in on some of the MOVE trials to see how the courtroom played out for real. I did, and I was shocked; I couldn’t believe it, it was nothing like the textbooks or the professors described. I kept going back and going to the prisons to visit MOVE people. I ended up getting arrested at a MOVE trial. I represented myself; confident in standing up and telling the truth. Judge Lynne Abraham, who later became District Attorney Lynne Abraham, found me guilty and sentenced me to 60 days in the county jail. Well, I had never done time like that before. But I owe her a huge thanks because she sent me to the county jail for two months, up close and personal with MOVE women. That was all she wrote! When I came out of those two months, I wasn’t going anywhere. I was firmly ensconced in MOVE. That was the best thing Lynne Abraham could have ever done for me. JW: Why does MOVE consider itself a family and not an organization? RA: One of the first things John Africa taught us is what family really is. It has nothing to do with being birthed from the same mother, or having the same father. It’s having each other’s back; fighting together, laughing together, loving together, encouraging each other. But let me make this clear, we do not support or stand up for each other when we are wrong. We stand up for what is right. If you are wrong, we are going to correct you. That’s true love. PA: John Africa built a strong family. A family committed to tearing down this system in protection of life. When you hear a MOVE family member speak, they talk about the protection of all life. John Africa taught us: until all life is free, no life is free. JW: Ramona, after the 1985 bombing, what did you do to maintain your peace and love? RA: You could have never told me I could have gone through May 13, 1985. That I would ever go through something like that, and if I ever did, that I would stay strong and continue in the direction I am committed to. Nobody could ever convince me of that, but because of what John Africa put in me, and all MOVE people, I am able to still be working, still stand strong despite what I have been through. Two reasons why I am still here; I know what I believe in and what I am involved in is right and cannot be proven wrong. Secondly, because I understand there is no option. What am I going to do? Just bow down and roll over to a system that bombed me, tried to burn me alive, murder my family? I’m just suppose to say, “Oh okay, let’s move on”? No Way! There is no option, and that’s why I continue to work and do what I need to do.